Zionism Unveiled: What color are the Israelites? What color are the Israelites? EDITOR'S NOTE: This post is an expansion upon the "Who Are the Gentiles?" article posted on September 2, 2010. Let's begin this study in Genesis 10 . Here we see that everyone on earth descended from the three sons of Noah. Noah, his wife, their sons, and their son's wives were saved by Yahweh from the Great Flood that Yahweh brought upon the earth, killing all of Adam's seed except for Seth. There is not a descendent of Cain, or Abel, alive today. Noah descended from Seth. Now these are the generations of the sons of Noah, Shem, Ham, and Japheth: and unto them were sons born after the flood. The sons of JAPHETH; GOMER, and Magog, and Madai, and JAVAN, and Tubal, and Meshech, and Tiras. And the sons of GOMER; Ashkenaz, and Riphath, and Togarmah. And the sons of JAVAN; Elishah, and Tarshish, Kittim, and Dodanim. An in-depth Bible Encyclopedia shows that Magog is Russia today, Javan are the Greeks, and ALL the seed of Japheth are the EUROPEAN people. Let's see what the biblical name of the Europeans are. By THESE (sons of Japheth) were the isles of the Gentiles divided in their lands; everyone after his tongue, after their families, in their nations. to "nations," "heathens," "maritime peoples," and "coastland peoples." It may be quite obvious to many of you that I'm not a scholar in English usage, but one thing I do know is that you can't properly substitute an improper noun for a proper noun. First of all, Shem and Ham begat nations also, and wherever the sons of Ham and Shem lived they had water (maritime), a coast (coastland), and they were heathens also. So why do these other Bible translations use those deceitful, and meaningless terms in Genesis 10:5 instead of "the isle of the GENTILES?" I guess I've answered my own question. Check your Bible version. If it uses any of those phrases above which are listed in Genesis 10:5, then now you know how it is supposed to read. Paul was an apostle to the Gentiles. All of these that he wrote, the Romans, Corinthians, Galatians, Thessalonians, except for his own kinsmen, the Hebrews, were European/Gentiles. This is why you don't see a book for the Ethiopians, the Egyptians, and the Assyrians, because these nations had already had converts, and knew of the Elohim of Israel. The Gentiles did not. The prophets, at various times were sent preaching to Hamitic and Shemitic nations throughout the Old Testament period. One example is when Jonah was sent to the Assyrians, and the king and nation repented. Israel had always been a mixed-multitude, but the Gentiles were never a part of the congregation of Israel. We will read this point later. Now though, let's note that according to the last passage we read, we were separated according to the tongue Yah gave our ancestors that lived during the building of the Tower of Babel as recorded in Genesis 11. We were NOT separated according to the color of our skin. This is why there are many nationalities of the same skin complexion. Using skin color as a means of division or identification is confusion. Another fallacy that we are all victims of is the notion that the union of two people of various nationalities produced "mixed children." This is incorrect. The lineage goes according to what your father is. You are what HE is. He planted the seed, just as an apple seed is planted in the ground. What comes up is what was planted. This is why, regardless of what nationality the women ancestry that Yahshua had was, he was an Israelite according to his fathers (patriarchal) lineage. Somebody tell me where does modern-day "Judaism" get the notion that you are a Jew according to your matriarchal lineage. EDITOR'S DISCLAIMER: THE BIBLE CLEARLY STATES THAT CHRIST WAS BORN OF A VIRGIN...AND THAT THE MOST HIGH IS HIS FATHER. IT WAS A MIRACULOUS BIRTH, INDEED. GOD IS NOT AN ISRAELITE OR ANY NATIONALITY FOR THAT MATTER. IT WAS THROUGH THE LINEAGE OF MARY THAT JESUS OBTAINED HIS ISRAELITE IDENTITY AND NATIONALITY. And the sons of HAM; Cush, Mizraim, and Phut, and Canaan. These four sons are the "progenitors of the "African" peoples. "African" is really an inaccurate name for these people, reason being, the word "Africa" derived from an Italian General named Scipio Africanus. He conquered that land mass called Africa for the Italians. Africa, the land mass, does not extend east of Egypt. Africa ends at the man-made Suez canal which was built to separate Africa from the "Middle East". Geographically, the land of Ham extends far beyond the Suez Canal. 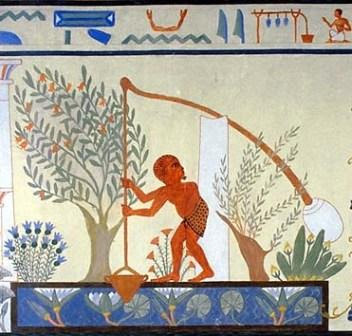 The land of Canaan (the fourth son of Ham) is located east of the Suez Canal. The Hittites, which descended from Canaan, dwelled even further north. Let's see who descended out of these four sons of Ham. The Cushites name were changed by the Greeks to "Ethiopia," which is translated from the word "Athiop" which means "burnt-faced." Mizraim's name was changed by the Greeks also to Egypt. Egypt means "black." Present day Egypt have been comprised of mostly Arabs since they conquered the land in the sixth century. This is how the Hamites (African people) became (converted to) Islam. Most black Muslims refuse to accept this fact. The descendents of Phut are the ancient Libyans. Libya now is also an Arab-dominated land. 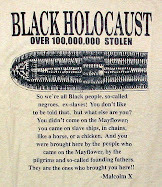 The Caananites' land is the Promised Land given to the Israelites. And Cush begat Nimrod; he began to be a mighty one in the earth...And the beginning of his kingdom was Babel. Yahweh has given the seed of each of the three sons of Noah, a time to rule. The Hamites ruled first, beginning with the Ethiopians. Nimrod, as stated earlier, was an Ethiopian. ...the brother of Japheth the elder, even to him were children born. ...And Arphaxad begat Salah; and Salah begat Eber. And unto Eber were born two sons: the name of one was Peleg; for in HIS DAYS WAS THE EARTH DIVIDED; and his brother's name was Joktan. Now we see the significance of Eber. Eber was alive during the scattering of the nations at the Tower of Babel. The name "Eber" means "to pass over" and it is translated to "Hebrew." Eber is the father of the Hebrews, not Abraham, as many people think. God gave Eber the tongue that was spoken by his descendents, and that is the Hebrew tongue. In Genesis 11 we see that Abraham descended from Eber. Abraham's seed includes the Ishmaelites, the Midianites, the Edomites, and the Israelites. Genesis 25:21-26 And Isaac intreated Yahweh for his wife, because she was barren: and Yahweh was entreated of him, and Rebekah his wife conceived. And the children struggled within her; and she said, If it be so, why am I thus? And she went to inquire of Yahweh. And YAHWEH said unto her, TWO NATIONS are in thy womb, and TWO MANNER OF PEOPLE shall be separated from thy bowels; and the one people shall be stronger than the other people; and the elder shall serve the younger. And when her days to be delivered were fulfilled, behold, there were twins in her womb. Now remember, Elohim told Rebekah that there were two nations and two manner of people in her womb. We are about to read the first difference between these twins. Esau looked different from the rest of Isaac's family. We know this because Jacob's features were not described. And for him to be the first-born, Esau had to have been a sight for him to have had to be described. At this time, I won't get into what went on between Jacob and Esau, and their eternal battle, but I will sum it up to present day. The Edomites, (descendents of Esau) converted to Judaism in 125 BC by the Maccabees. They eventually formed their own religious sect called the Herodians. The Pharisees (to their own destruction) conspired with the Herodians regularly, to tempt Yahshuah. (Mark 12:13) At that time, the region of Judaea was ruled (thanks to the Romans) by the Herods. When the Romans laid seige to Jerusalem in 67-70 AD, King Herod Agrippa II, and his kinsmen, the Edomites (Idumeans), no longer called themselves by their name. They have been known as the Jews, since. But now that we see that Israel looked totally different from Esau, lets see if we can see who the Israelites looked like. In Exodus we read about the time when Pharaoh commanded that all newborn male Israelites be cast into the river. One Levite (a tribe of Israel) woman bore a son and she hid him as long as she could until she eventually obeyed Pharoah. She put her son in the river, but she put him in an ark first. This child was put in the river among flags so that it wouldn't move so that Miriam, his sister, could see what would become of him. Pharoah's daughter found him where Miriam put him among the flags and SHE called his name MOSES, and she raised him as her own son. Moses lived as an Egyptian until he killed an Egyptian and fled Egypt. He came to a well in Midian, and defended the daughters of Reuel, the priest of Midian. When Reuel asked his daughters how they happened to water the flock so soon. Now if Moses was white, or any other color than black, would Reuel's daughters thought that Moses was an Egyptian? Now after Yahweh instructs Moses concerning his mission to deliver Israel out of Egypt, YAHWEH give Moses powerful signs whereby he would cause the Israelites to believe that Yahweh sent him. One of the two signs was featured in the movie "The Ten Commandments." The greater of the two signs was not. ...And Yahweh said furthermore unto him, Put now thine hand into thine bosom. And he put his hand into his bosom: and when he took it out, behold his hand was leprous as snow. Now why didn't Charlton Heston perform THIS sign? And he said, Put thine hand into thy bosom again. And he put his hand into his bosom again...and, behold, it was turned again as his other flesh. So neither Jacob, nor Joseph, nor Moses, looked "red" like the Jewish (Edomites) people, or white like the Gentiles, they were all black like the Egyptians. Moses sister, Miriam, spoke out against Moses because he had married an ETHIOPIAN woman. This is what Yahweh did to Miriam. Now if Miriam was white or "red," why did he turn her white. Why not turn her the same color as the Ethiopian woman since she made herself to be better than her. Miriam was ALREADY the same color of the Ethiopian woman, so he turned her white instead. Leviticus 13, mentions two kinds of leprosy, clean and unclean. Leprosy, is a skin disease, and the unclean leprosy is when blotches appear on the skin. Clean leprosy is when your skin turns white. On this note, I have to ask the Mormons, how in the world can Israelites, like the so-called Lamanites could have been cursed with dark skin when the only skin color curse that any Israelites experienced according to the Bible, was the turning of their skin white? Joseph Smith had a WILD imagination! In Matthew 2, Joseph, Miriam, and Yahshua, fled from Herod, the Edomite king of Judaea and hid in Egypt among other black people, just as Moses "hid" from death in Egypt. Even the apostle Paul was mistaken for an Egyptian. An Israelite have never been mistaken for any other nationality that wasn't black. Acts 21:37-39 And as Paul was to be led into the castle, he said unto the chief captain, May I speak unto thee? Who said, Canst thou speak Greek? When the evil and diabolical Hitler had the "jewish" people in the concentration camps, many of them were in a famine. Their skin was a pale white. When the Babylonians laid seige against Israel, the Israelites were also in a famine. This is how the prophet Jeremiah described it. Lamentations 5:9-10 We gat our bread with the peril of our lives because of the sword of the wilderness. OUR SKIN WAS BLACK LIKE AN OVEN BECAUSE OF THE TERRIBLE FAMINE. When brown or black people get sick, or don't eat for a long time, they get darker. When white or "red" people get sick or don't eat... they get pale. This chapter, as well as the entire book was not meant to offend anyone and I'm sorry if it does. This chapter's only purpose was to help shed light on a subject that have been a subject of debate in these modern times. 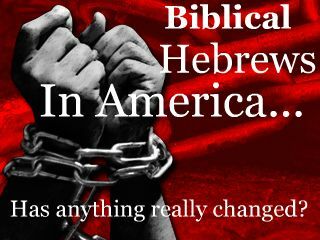 Now that we know that the Israelites are black, lets find out how we can identify them. See you in the next chapter. EDITOR'S NOTE: People will become infuriated over the discussion of the ethnicity and "color" of the Israelites because it DEFIES conventional paradigms of how we view the Biblical peoples, particularly the children of Israel. Egyptian Influence Upon the Hebrew Religion? The Egyptian Roots of Christianity?